The Pride Sonic Mobility Scooter for sale has just been used twice. The scooter has two seats, a basket and comes with a winch to lift it in and out of the trunk of the car. If you would like to write a review or voice any opinions on the Pride Sonic, you may use the comments form below this ad for this purpose. Thanks for visiting GoGoCycles Used Mobility Scooter Classifieds and for taking a look at my Pride. 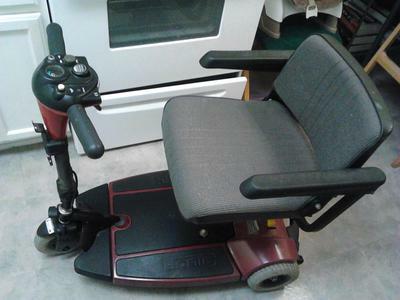 The location of the Pride Sonic Mobility Scooter for Sale is Antioch (near Nashville TN Tennessee )and my asking price is $2000. I contacted a medical supply store and they said that the current price for everything here is roughly $2800. If you want to take a look or have questions please send me a text(NO EMAILS) to 615881six165 for more details and don't forget to mention that you found this ad on GoGoCycles Used Motorcycles and Parts for Sale www.gogocycles.com.